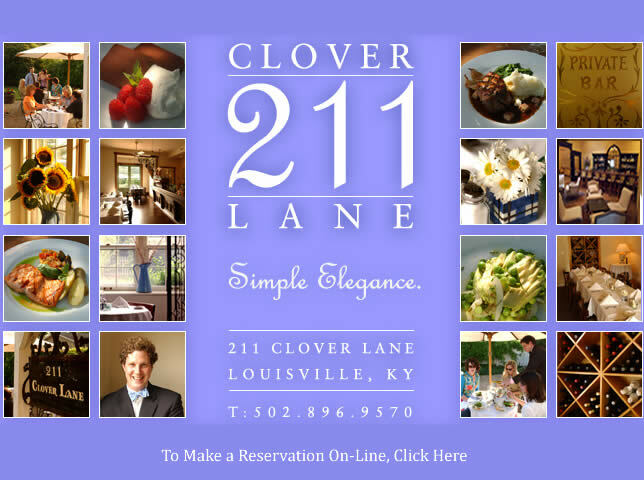 211 Clover Lane is a quaint - yet elegant restaurant located in the Louisville, Kentucky neighborhood of St. Matthews. Located at the Colony Center in St. Matthews, 211 evokes an atmosphere of the French countryside. The restaurant’s interior is decorated simply with fine French and American antiques, and the soft music and gentle lighting create the perfect atmosphere in which to enjoy wonderful food and company. The patio area is just as charming for those interested in al fresco dining. We are also happy to announce that we have renovated and expanded our bar area to create a beautiful, relaxed atmosphere for patrons to enjoy before dinner or to simply stop by for a drink. 211 Clover Lane is open Tuesday through Saturday for lunch from 11:30 AM - 2:30 PM and for dinner from 6:00 PM to close. We are also open Sunday for brunch from 10:30 am - 2:30 PM. Reservations are suggested but not required. Click here to see our intmate dining area.